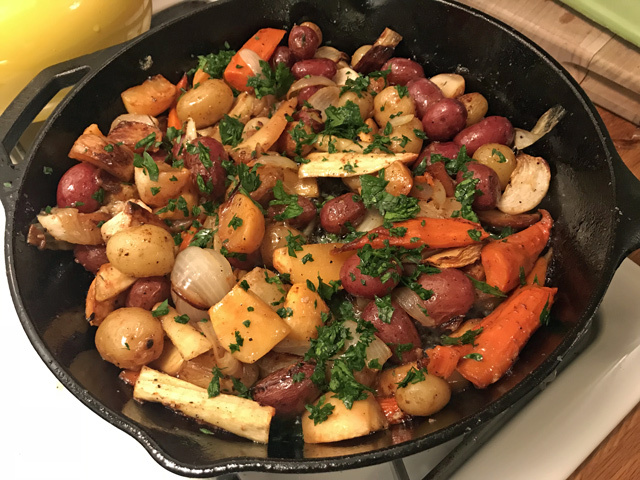 A year or two ago, I got rid of my roasting pan. Not because I’m anti-roasting pan, or because I needed the space, but because I realized that my roasting pan had a non-stick surface and that I’d been scratching it up with a metal spatula over the years and that there was a teensy, tiny chance I’d been exposing myself and my loved ones to carcinogens whenever I roasted a chicken and that we’re all going to die and it’s all my fault. 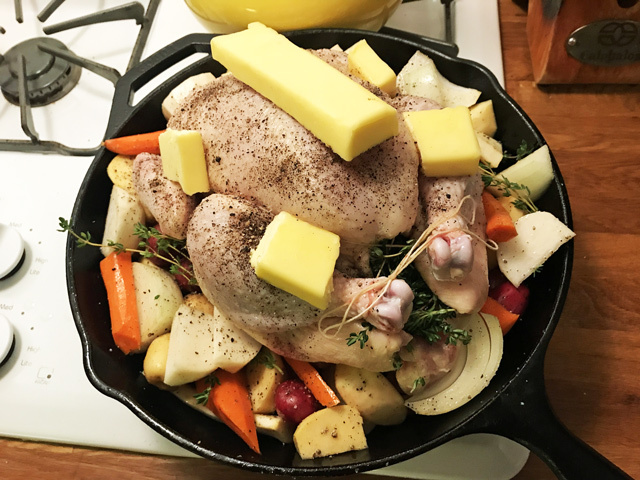 So these days, when I roast a chicken, I rely on my largest cast iron skillet. Frankly, I think it works better. And I riff on the beloved Thomas Keller roast chicken recipe, the one I’ve been making for the past eight years, combining assorted root vegetables and potatoes and garlic in the bottom of the pan with a splash of vegetable oil, salt, and pepper, and then topping it with a chicken that I stuff with thyme and garlic, also rub with vegetable oil, before sprinkling with lots of salt and pepper. Only, I’ve been much bolder with a certain ingredient to really make my roast chicken shine. Can you guess what it is? Hint: it starts with the letter “b” and it rhymes with shmutter. 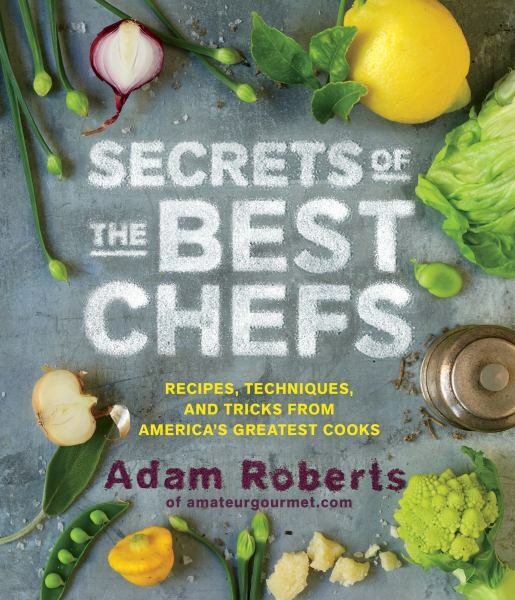 You know, in addition to PBS, one of my biggest sources for cooking inspiration is Instagram. 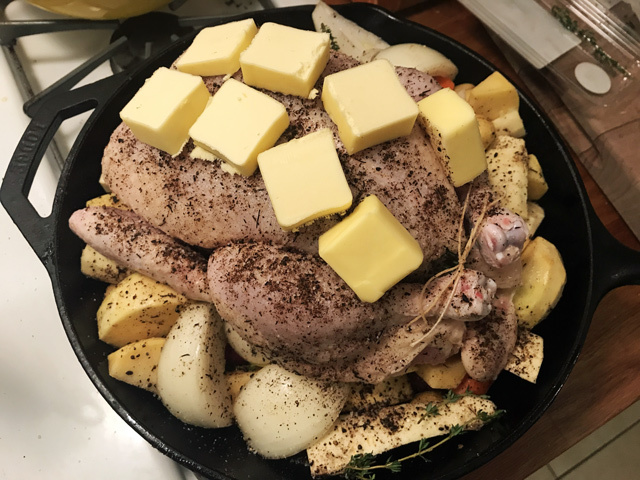 I follow lots of chefs and food people on there and not too long ago, I was looking at Ludo Lefebvre’s feed and he positively slathered a chicken in butter. 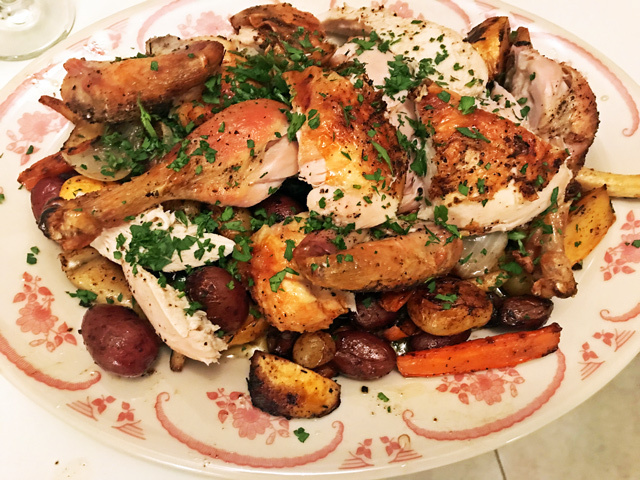 Ludo’s food at Trois Mec and Petit Trois is some of the best French food in L.A., so when I saw that, I made a mental note: the next time I roast a chicken, I’m going to use more butter than usual. And you know what? It makes a big difference. Not only does it keep your roast chicken moist, it also helps it brown up beautifully. 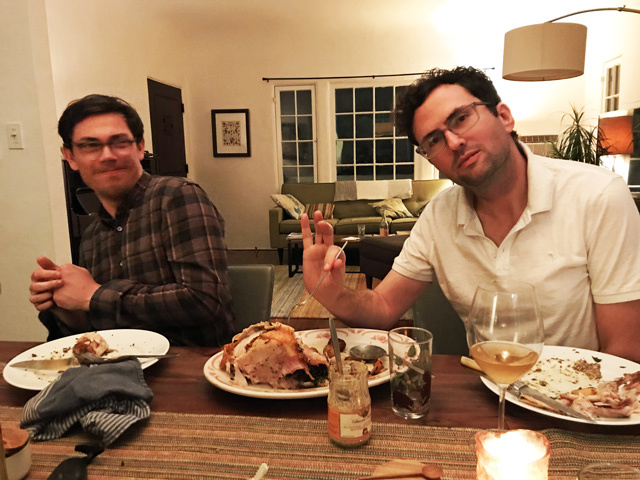 I mean just look at last night’s bird. 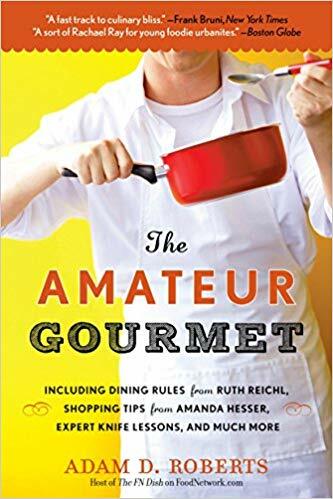 The other big step I’ve been taking has to do with cooking time. In the past, I used to worry about overcooking the chicken; now I worry about undercooking it. 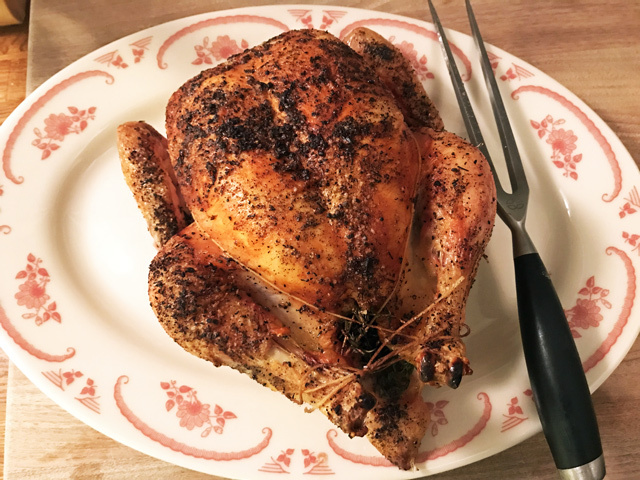 Through my various roast chicken experiments, I’ve discovered that the longer I let it sit in the hot oven, the better it gets. Very rarely does the breast dry out (probably because of all of that butter) and the legs and dark meat get properly done, they become almost fall-off-the-bone tender. My new procedure: start at 475 for 20 to 30 minutes, until the outside is really brown, lower to 425 and then cook for an hour more. So 90 minutes total. The other thing I do? 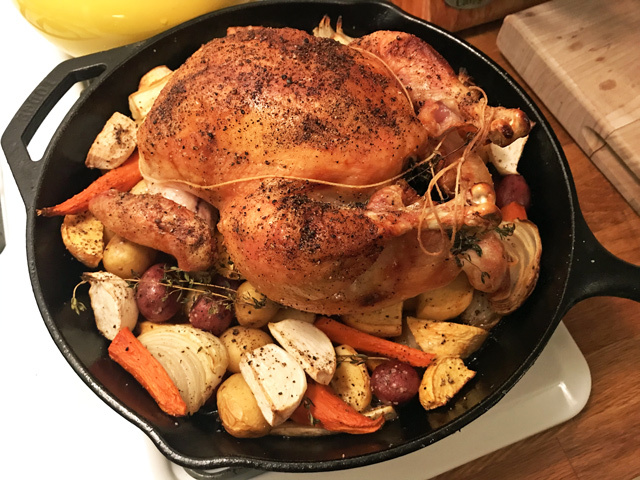 Once the pan’s out of the oven, I lift the chicken off, put it on a plate or platter to rest, and, after tossing the vegetables around a bit with a metal spatula, I stick the pan back in the oven to get the vegetables even more caramelized. Finally, last night, I figured out the perfect way to serve my roast chicken. Scoop all of the vegetables on to a platter, then cut the bird up with a big knife and place the pieces on top, sprinkling everything with parsley. Who wouldn’t want to see that on their dining room table, especially as it starts to get chillier outside? Serve with Dijon mustard, a bottle of Pinot Noir, and that’s pretty much the perfect roast chicken dinner, as far as I’m concerned. You could add a salad, but after all of that butter? You’d only be kidding yourself.